Steven S. DeKnight takes over the director’s reins from Guillermo del Toro making his directorial debut in the sequel to the 2013 hit PACIFIC RIM. PACIFIC RIM is del Toro’s most successful film at the box-office making over $400 million worldwide at the box-office. UPRISING costing $150 million aims to do the same. The premise of the first film which is the backdrop for uprising is summarized in voiceover at the start of the film by Jake Pentecost (John Boyega from STAR WARS). That film was set in the future, when Earth is at war with the Kaiju, colossal sea monsters which have emerged from an inter-dimensional portal on the bottom of the Pacific Ocean. To combat the monsters, humanity united to create the Jaegers, gigantic humanoid machine robots, each controlled by at least two pilots, whose minds are joined by a mental link. The Jaeger was championed by General Pentecost, Jake’s father played by Idris Elba. Jake was partying it up when the film opens. UPRISING is set ten years after the Battle of the Breach, the oceans have become restless once again, but the Jaeger program has evolved into the next generation for the PPDC. However, a mysterious organization has reopened the Breach for the Kaiju and a Jaeger has gone rogue. Jake Pentecost, son of Stacker Pentecost, rises up to stand against the evolved Kaiju and the mysterious rogue Jaeger, Obsidian Fury, to prevent humanity’s extinction and preserve his father’s legacy. The film is divided into two parts. One is the action sequences, which with its $150 million budget are executed with all the pyro-technics, metal crunching and noise expect from a Hollywood blockbuster. The film will also be released in iMAX which boasts – “See a movie, or be a part of one.” Regardless, be prepared to get a headache. This is a very loud film. The second is the camaraderie among the Jaeger group. 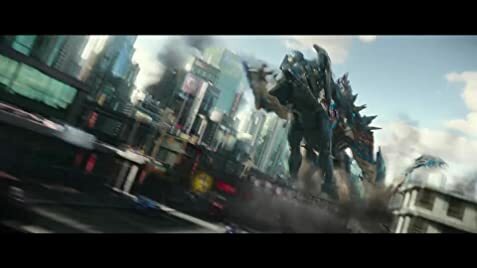 Jake Pentecost bonds with Mako Mori to lead a new generation of Jaeger pilots, including rival Lambert (Scott Eastwood, Clint’s son) and 15-year-old hacker Amara (Madeleine McGraw), against the new Kaiju threat. The pilots are all buffed and ideal specimens of the human race. The script by Steven S. DeKnight, Emily Carmichael, Kira Snyder and T.S. Nowlin displays the normal enmity as well as camaraderie of the Jaeger fighters. But dialogue like: “…not how you perform but what people think how you perform…” are meant to be taken tongue in cheek, playing with typical cliched lines. The banter between Dr. Newt Geiszler (Charlie Day) and Dr. Hermann Gottlieb (Burn Gorman) works better. As the first film was huge hit in China, UPRISING has a few scenes shot in China, as observed by the Chinese on the streets running away from the monists, looking like old monster movies. 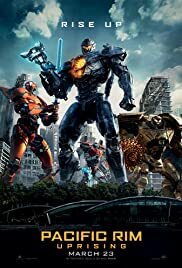 Despite the efforts for making PACIFIC RIM UPRISING rise above the first PACIFIC RIM and TRANSFORMER franchise, UPRISING turns out to be a big bore with too much noise and CG effects.